The Mobile World Congress is less than two weeks away and now, we are getting more confirmations about the devices that will be unveiled on the show floor. Just like every year, TCL’s Alcatel is coming with no-nonsense budget Android smartphones. 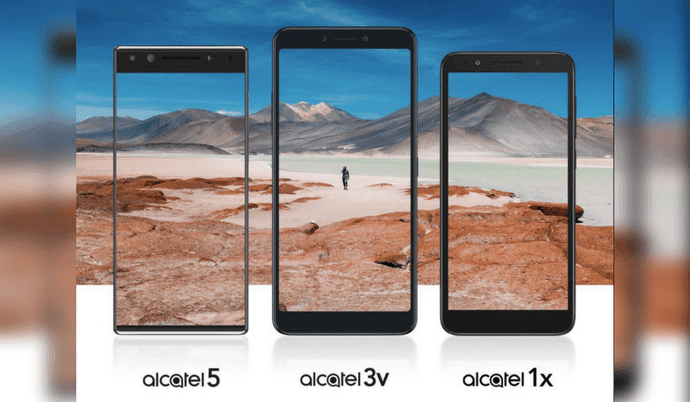 The company has officially confirmed to unveil the Alcatel 5, Alcatel 3v and Alcatel 1x smartphones on February 24th. On the same day, Nokia and Samsung will also announce their latest smartphones. The Alcatel 1x will be most affordable device among the trio and might offer 18:9 aspect ratio. It will be coming with a fingerprint sensor, single rear camera, and a MicroUSB 2.0 port. Talking about the Alcatel 3v, it sports 18:9 display with the thick bezel on the top and bottom. However, the Alcatel 5 offers a three-sided bezel-less display and dual selfie cameras. Based on the earlier announcements, the Alcatel 3v will be coming with a 6-inch 18:9 display with Full HD+ (2160 x 1080 pixels) resolution. It will come powered by a MediaTek quad-core processor coupled with 2GB of RAM and 16GB of internal storage. The smartphone will be featuring 16MP + 2MP dual cameras and a circular fingerprint sensor on the rear. Though the Alcatel 5 comes with an unorthodox three-sided bezel-less display, it only offers HD+ (1440 x 720 pixels) resolution. It will come powered by an unspecified MediaTek octa-core processor. There will be 3GB of RAM and 32GB of internal storage. The Alcatel 5 will be sporting a 12MP rear camera and dual front cameras. It will be priced around $300 and comes with USB Type-C port and Face Unlock. We expect all these three new devices to run on Android 8.0 Oreo out of the box.